Your wedding should be just as festive as any big celebration you’ve participated in, till date. So, don’t hesitate to add a little sparkle and shine to your wedding day, and give it the vibrant and festive touch it deserves. Whether you have your wedding at home, at a cool, exotic destination far away from home, or during the holiday season, here are some fantastic festive wedding ideas for you to incorporate into your lifetime celebration. 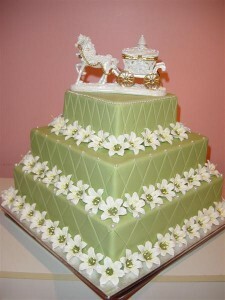 At most weddings, the wedding cake is the star dessert at the reception. So, it has to look as good as it tastes. An impressive cake is an instant attraction. So, make no mistake in choosing one that is beautiful and has great style. A quick visit to our cake gallery at Best for Bride will draw your attention to the hundreds of artistically created designs, that are perfect for conjuring up festivity and fun at your reception. From the wide selection we feature, we have chosen to show you this cake today, for the elegant and interesting elements it features. A serious-looking green tiered cake, with diamond embossed sides and lovely lily flowers along the length on all sides, this lily garden cake is an arresting design that will steal the limelight at your reception. Adding a touch of class is the classic horse and carriage cake topper. Simply perfect for an elegant classic wedding! A flounced organza skirt with ruffles that scatter, an attractive sweetheart neckline and embellished bodice with an accented waistline—this is the perfect dress to impress the guests at your wedding with. The dramatic wedding gown from the Mori Lee collection. This 2815 is the perfect example of a dress that is can amaze, because of the memorable impression it creates. The textured tiers add grace to your step, and will softly glide along as you stride down the aisle. The embellished bodice scintillates and shines softly, in contrast to the feathery skirt featured in the dress. A dress that is bound to steal many hearts, this is one that will help you revel in the festive vibe that you envisioned for your big day. Pair it with a scarlet lipstick and a stunning hairstyle, you will be transformed into the most stunning bride everyone’s ever seen. Dress up your bridesmaids in killer colors, so they shine brighter than all the guests at your wedding. A full-length gown is a must to pack in a punch, and when done in lovely satin, like this Alfred Angelo bridesmaid dress, it will be a dress that is simply stunning. With the Mix ‘n’ Match trend going strong, it will be easy to choose the brightest colors in your color palette, and find a dress that enhances the complexion of each of your bridesmaids. The sweetheart neckline and draped bodice with a dropped skirt design, make this dress a stylish choice that your bridesmaids will love to wear. The gathering of the dropped waist in a scattering of organza flowers, renders extra-feminine charm to the overall design. A design that is youthful, figure-flattering and stylish, this is a dress that will be the perfect representation of the holiday spirit of fun and frolic at your wedding. The flower crown is an accessory that instantly makes a statement. And this time, we are looking at ones that are big and bold enough to create an instant impression. If there is one person in your wedding party who will have no qualms in playing dress up with the most over-size accessories, it has to be your flower girl. 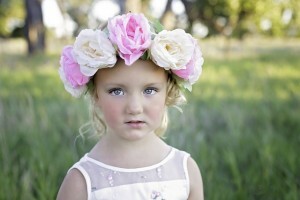 So, make the most of this opportunity, and dress up your cute little bridal attendant in an over-size flower crown, like you see here. Not only will you make the little girl extremely happy, it will also add the necessary touch of festivity and fun to your wedding scenery. The picture featured here would be perfect for a garden wedding, or any outdoor ceremony. However, you can adapt the same design for any color palette by simply switching out the blooms with ones that match your wedding theme colors. A small job for your florist, but one that will make a statement at your wedding. Don’t you think it’s great? 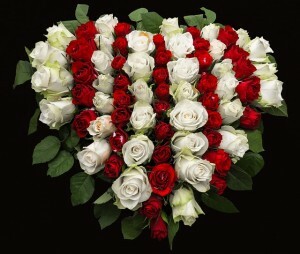 Flowers have the power to color up any arrangement, and that too magically! So, choose your bouquet and those of your bridesmaids to be lively and vibrant. Add a luxurious dose of the brightest colors, and mix it up with other wispy, whimsical details, so the bouquets look rich, abundant and very attractive. Consider mixing colors like blue and white, or red and white, where the deeper colors are intense and pop against the neutrals, for maximum impact. Add an instant pop of color to your wedding menu, with signature cocktails in a range of colors. Keep the assortment trendy, by matching it with the colors of your wedding palette. Colorful beverages, dressed up with cute accessories are inviting, and you will have your guests swooning over the details. It doesn’t have to be expensive either. The simplest of simple glassware receive a fresh update, when it contains colors so vibrant. A sprinkling of colored sugar crystals along the rim, and the addition of striped straws or tiny flags are all it takes to jazz up your cocktail hour with finesse and fun. If you really want to go with it all the way, add in olives or fruit slices, and you have a drink that is really exciting to look at. 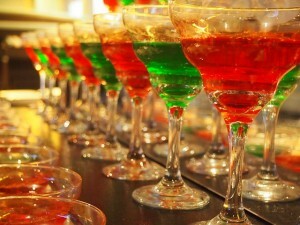 Featured here are cocktails in the signature green and red Christmas colors, but you can do the same with any color, including blue, purple and gold. Nothing makes a room more cheerful and glowing than candles, and this is one element you should incorporate into your décor. Candles are relatively inexpensive centerpiece accessories, but can quickly be dressed up with flowers, glass, fruits and anything else you can think of. They are versatile, as you will have plenty of choice in color, size, scent and appearances to choose from. 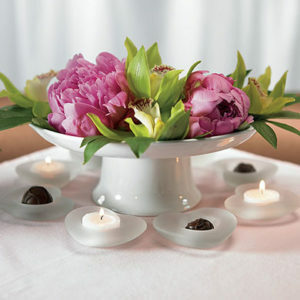 Thus, crafting your own unique centerpiece will be easy, when you incorporate candles into the design. Place them in glass bowls and they will look spell-binding, as the glassy effect makes the warmth of the glow more pronounced. By choosing suitable colors for the candle-holders, you can achieve a colored glow that will add a pleasant note to the ambiance. So, bring in some festive cheer to your big celebration, by adding lots and lots of candles. With scented ones, you can also have the air smelling great and this will also linger on in the memories of your guests, when they think of your wedding. Soft scents like lavender, vanilla and lime are really refreshing, and will work for any season and weather. In a welcome deviation from the traditional table setting, you can have the table linen arranged in an unusual, but welcoming style. Here is a sample. The pretty dinner napkins do not need napkin rings, but are exquisite for the styling and the pattern they sport. The bold prints on the edges have been showcased beautifully, and focus is shifted to the design immediately. This simple addition to the table, makes it spectacular. So, it is not only cost-effective, but beautiful as well. Match the napkins to the table runner, which in this case is a rectangular table, and you have an easy but glamorous way to make your tables look beautiful. If the earlier style is too refined or serious for your taste, consider adding a dose of glamour to your reception tables with subtly scintillating table cloths. 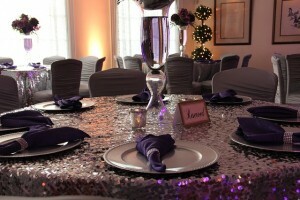 Anything with crystal or rhinestone details is immediately festive, and the bling on the table serviettes achieve this effect here. Club it with a deep, dark palette, like the purple used in intense doses here, and you have a vibrant and lively scene. The silver charger plates add to the brilliance of the glittering table covers and overall the setting has a wonderful designer aesthetic. 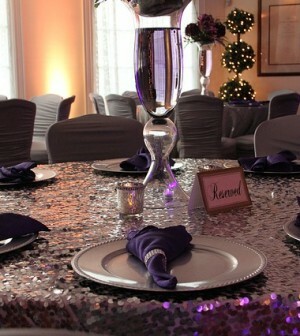 The best thing about all this is that the centerpiece is simple, yet stunning. So, it is a practical arrangement that doesn’t compromise on style. We can also see colors like maroon and dark green replacing the purple with equal capacity. Sprinkles, beads, glitter and scattered details add a colorful and energetic note, that makes a setting instantly buoyant. A simple element like a sweet buffet can instantly be uplifted with the choice of a few desserts that contain different textures. So, mix up the smooth with the crinkled, wrinkled and rough, add in bright pops of colors and make sure the arrangement is neat, despite the chaos. 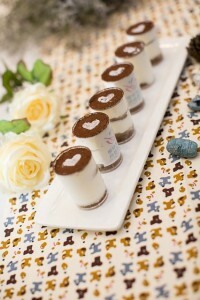 Consider items like macaroons, cake pops, cupcakes and mini-dessert cups to fashion the right effect. A few festive décor accessories like embellished platters, photo frames and beverage glasses decorated with ribbons around them are all it takes to dress up this signature reception setting, and it will add a sweet dimension of merriment. 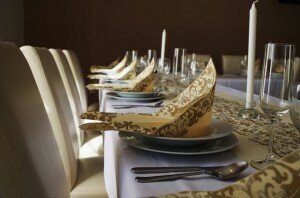 The perfect wedding setting will be a bigger festive treat for the eyes, than for any of the other senses. So, even if you are serving elaborate fare, make sure it looks as impressive as it tastes. Even the simplest dishes can be given a tasteful face-lift, by choosing pretty china and paying attention to the garnish. Here is an example of how even a simple dessert can be rendered special with the simple addition of a powdered heart to its top. Additionally, the arrangement in an individual platter makes it neat and picture-perfect. So, use this idea at your wedding, and add a colorful touch to your tables with simple, but elegant and impressive gourmet touches. Anything out of the ordinary, that can light up the sky or the venue, will uplift the spirits of those at your wedding, and add a spell-binding touch to the overall celebration. If you cannot create a firework display, you can still aim for a similar effect by lighting up your venue with a lavish choice of lighting. 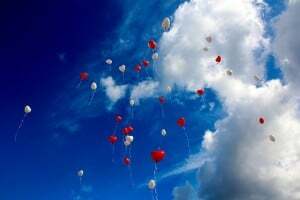 For an outdoor event, you can also create a similar vibe by using plenty of balloons that rise up and float away, thus forming an impressive display. This doesn’t cost much, but is very impressive. If the function is held indoors, make sure that your venue gets that first impression with an illuminated and well-decorated entry. 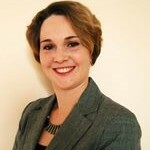 Dress up the venue to look entirely different from how it is usually done, and you will achieve that unique effect. Consider adding an elaborate vignette that is bound to be noticed, and tie it to the theme, so it blends in seamlessly. Your exit from the ceremony and reception play a great role in adding the final touches of drama. So, make your choice of transportation wisely. We think a horse and carriage is a splendid idea, as is a vintage car in a bright, noticeable color. Don’t hesitate to decorate it in full-style, so it stands out and will forever be remembered. 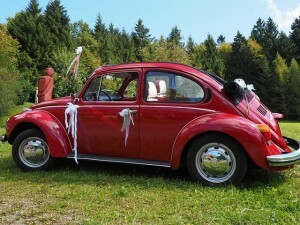 Here is a bright, merry red beetle, that is just perfect for a festive wedding. Simple elements like white ribbons add the finishing touches to the already-splendid looking car. So, tell us if you want your wedding to be festive and fun, or serious and sophisticated? Either way, we have the solution for the perfect wedding dress, accessories, bridesmaids dresses, cakes, favors and everything else you need to get the effect right. Visit the Best for Bride website today, to look for more dramatic wedding gowns and find everything you need to plan your dream wedding day. Check out our online gallery today, and we are sure you will be impressed by all that we have to offer. I love that red beetle at the bottom! That would be my dream car for driving away from the wedding! These are great ideas! Making a big splash at the reception seems like something that I might be interested in for our wedding day. 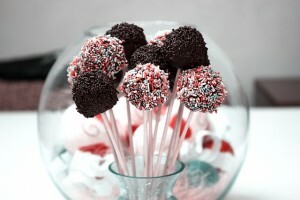 I like the idea of having the lolli pops at the table for the guests. Kind of cool, plus kids will be all over that! Great ideas. Thank you for the post. Keep up the good work!